As it is, this is the age of the internet and it’s impossible for fake news stories like this to fly with an increasingly informed and connected public. When The Guardian ran its hit piece on the independent researchers like Vanessa Beeley and Eva Bartlett and Tim Anderson who are countering the mainstream White Helmets / Syria narrative, they just responded on their own websites and social media and in interviews on independent media sites, probably reaching more people in the process. 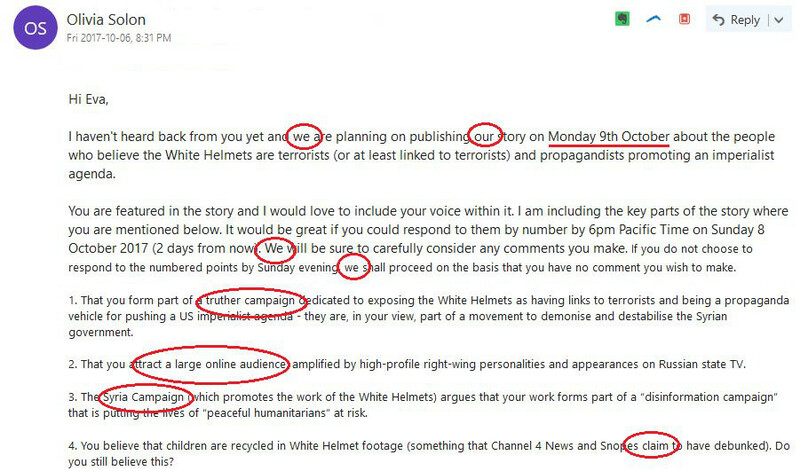 One of the highlights of this response came in Eva Bartlett’s rebuttal of The Guardian smear job, “How the Mainstream Media Whitewashed Al-Qaeda and the White Helmets in Syria.” In that report, Eva Bartlett published Olivia Solon’s actual emails to Bartlett when she was seeking comment for her article. Stop what you’re doing and read those emails right now. As I note at the end of my podcast: “Olivia Solon was contacted for comment on this report, but she did not respond to the request.” That’s right, of course I offered Solon a right of reply to the piece that I was writing about her story. In fact, I did even more than that: I very closely copied her own email’s style, format, and even some of her questions when I reached out to her. Sadly, though, Solon did not see fit to reply to my query. 2. That you rely nearly exclusively on The Syria Campaign for your “expert analysis” of the White Helmets and their trustworthiness despite The Syria Campaign’s admitted role as a PR firm lobbying for the White Helmets. You also completely ignore or exclude reporting on the Syria Campaign, its murky origins, its anonymous donors, and its ties to groups promoting regime change in Syria 3. 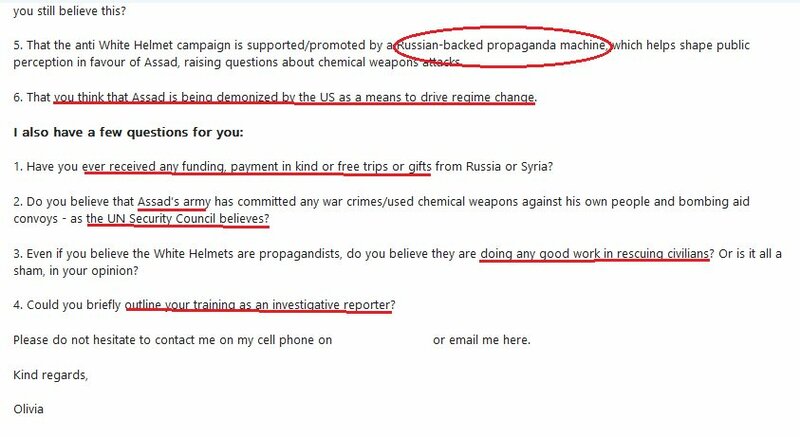 You believe that all opposition to the White Helmets is part of a smear campaign that is being coordinated by the Kremlin. Do you still believe this? 5. That you think that Assad is maniacally killing his own population and deploying chemical weapons on his own country, knowing that this is the one “red line” that would insure an invasion of Syria by outside forces, because he is a deranged bloodthirsty maniac and likely suicidal. 3. Do you think the public should take The Guardian seriously as an objective arbiter of the truth about the White Helmets given that their editorial board is on record lobbying for the White Helmets to win the Nobel Peace Prize? This article (An Open Letter to Olivia Solon) was originally created and published by Corbett Report and is published here under a Creative Commons license with attribution to James Corbett and CorbettReport,com. It may be re-posted freely with proper attribution, author bio, and this copyright statement.